Good things happen when our supporters contribute to making Hanson House a quality program. Why not make a personalized, tax-deductible contribution to show your support of Hanson House, however big or small, as we touch the lives of families and loved ones of those who are critically ill or injured in our hospital. All contributions will be recognized with the donor’s name and/or dedication. We accept all major credit cards (Visa, MasterCard, Discover) and personal checks. We are also always looking for donations to our pantry. Often, our guests have told us that "grab and go" items are helpful. Self-contained canned or boxed dinners, canned meat or fish, energy bars are welcome. Fresh or canned fruit and vegetables are also desired. We typically are well stocked with pasta and rice. Contact the Front Desk or Executive Director if you have these items to donate. 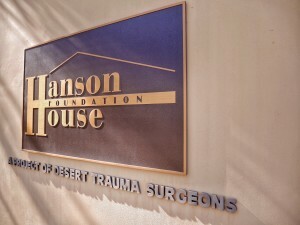 ​Please click the above Donate button if you would like to help with a donation to Hanson House. Hanson House is a California not-for-profit public benefit organization. A home away from home for families and loved ones of critically ill or injured patients. The Helping Hearts are the volunteer workers at Hanson House. To volunteer, please call the Volunteer Coordinator at Desert Regional Medical Center at (760) 323-6394. Volunteers work the Front Desk and assist in providing services to the families in Hanson House.